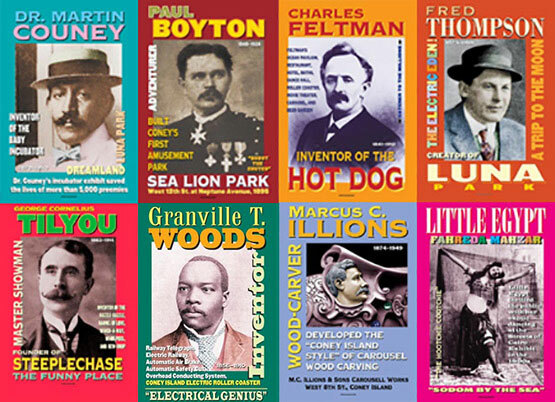 Inventors, performers, impresarios, and community leaders - these are among the many pioneers and visionaries whose creativity and ingenuity helped shape and define Coney Island over the past century. Each year, the Coney Island Hall of Fame pays tribute to a selected group of honorees. Their contributions are highlighted in an exhibit of colorful banners accompanied by illustrated text panels detailing their fascinating lives. "A fascinating, accurate, unexpurgated look at the World's Playground"
Take a stroll through Coney Island's amusement district--past, present and future--with the Coney Island History Project. Our unique walking tours are based on History Project Director Charles Denson's award-winning book "Coney Island: Lost and Found," the interviews from CIHP's Oral History Archive, and other primary sources. Walking tours are led by History Project staff including historian Charles Denson or poet/teaching artist Amanda Deutch, who have over 100 years of family history in Coney Island! All tours begin with a private visit to the History Project's exhibition center under the Wonder Wheel's iconic entrance sign on Denos D. Vourderis Place (West 12th Street), just a few steps off the Boardwalk. The 1-1/2 hour tour includes a talk on the exhibits and objects on display.